Although curtains are not a kitchen must-have décor item, when used, they offer functionality, visual interest, and personality. As usually kitchens are hard-working spaces full of appliances and cabinetry, curtains are a way to soften their look, embellish and enliven them, especially contemporary ones, which, as a rule, are of clean, minimal design. In addition, used alone or complemented by blinds or shutters, curtains provide privacy as well as light control and heat control. Keeping kitchen window treatment clean/especially near the stove and sink/ is usually an issue, so, choose easy to clean and maintain options. If you think you need to add curtains, before making any decision, consider carefully the number of the windows, their location, and the amount of natural light your kitchen gets. Generally, whether used for functional or purely decorative reasons, curtains are an option to add color, pattern, texture, and visual interest to any kitchen, whatever its style. However, especially if your kitchen has a garden window with a view, consider a no-treatment window solution. Unless privacy is an issue, unlike other rooms where curtains help lend a finished look, in kitchens, curtains are optional and their use depends entirely on the taste and preference of the homeowner. When it comes to providing privacy and light and heat control and air circulation, blinds, shades, and shutters are a common choice. Apart from being versatile, durable, and relatively easy to clean and maintain, they can also enhance the décor of the space. With virtually limitless solutions in terms of sizes, materials, designs, and colors, there is no a right or wrong choice, only personal preference and budget limitations. Usually, Roman shades and bamboo blinds are favorite, affordable solutions. Bamboo blinds work well in almost any style, lend the space a sophisticated, chic look, and add comfort and an organic feel. In the picture above, bamboo blinds offer privacy and light control, add warmth and texture, and lend this almost all-white kitchen an organic look. Window seating adds comfort and coziness. When it comes to customizable window treatment options for unusually shaped or sized windows, Roman shades are definitely an unbeatable choice. Plus, they add pattern and pops of color and beautify the space in a subtle, understated way. 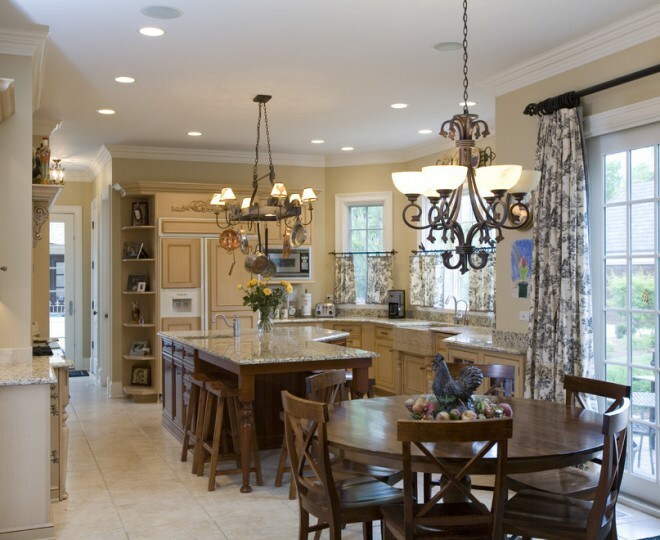 In addition, Roman shades can be coordinated with other kitchen fabric items for a harmonious, unified look. Not to mention that there is a range of easy, affordable DIY projects, which can help lend your kitchen a new, fresh look. 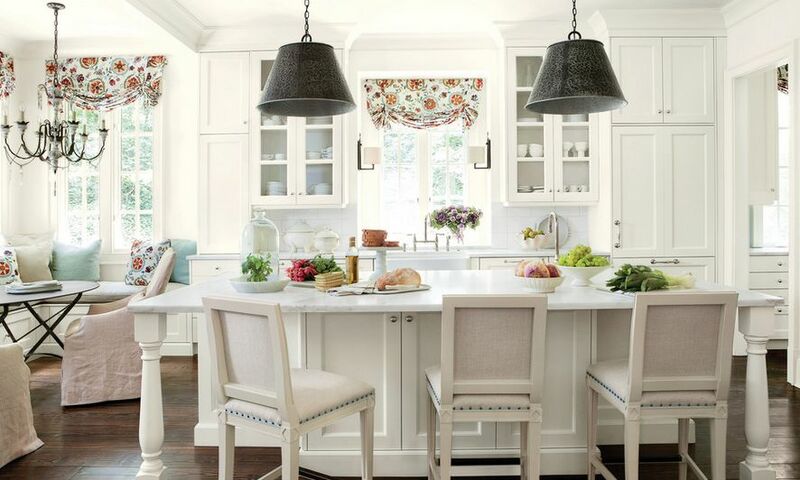 Shown above, a serene, elegant all-white eat-in kitchen. Floral-patterned Roman shades coordinated with the throw pillows add color, charm, freshness, and personality. A subway tile backsplash and marble countertops lend the space a timeless look. Valances, swags/scarf curtains/, and cornices are also options to consider. Although sometimes cornices are used to hide window treatment hardware, as they are a delightful way to dress any window, usually cornices, swags, and valances are a statement décor element incorporated for purely decorative reasons. Whether used alone or combined with other types of coverings, valances, swags, and cornices add color, pattern, texture, drama, visual appeal, and interest. Furthermore, all these options lend the space a finished look while still letting an adequate amount of natural light in the kitchen. On a side note, as they add charm and romance, swags can be used as an alternative to curtains or drapes to dress canopy beds. 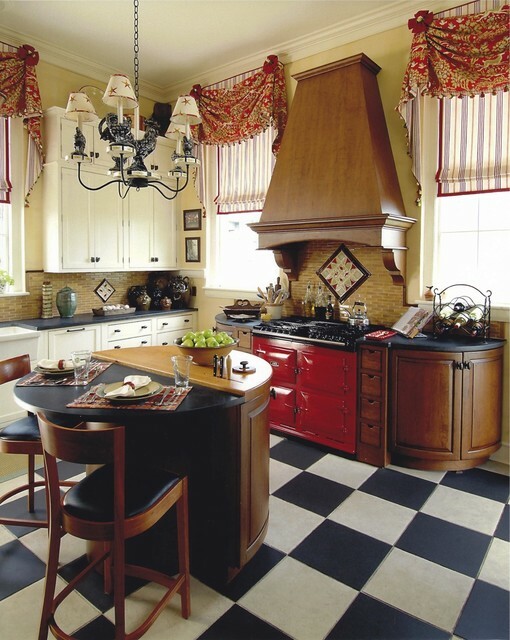 Above, a fascinating country-style kitchen. 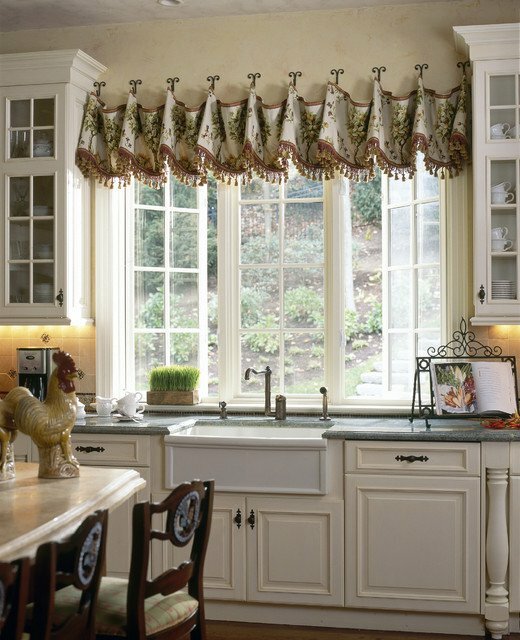 An ornate valance hung on iron hooks on a garden window adds color, softness, and visual interest and beautifies the space. In the picture above, a swag creates a sense of movement, beautifies, and adds elegance and tons of personality to this stunning eat-in kitchen. Café curtains are definitely an option that can lend any kitchen a unique look and add undeniable charm and elegance. As they offer some privacy without blocking natural light, in terms of both functionality and aesthetics, café curtains are a fabulous solution. Above, café curtains lend an elegant, finished look to this fabulous kitchen. When it comes to floor-to-ceilings windows, French doors, bay windows, breakfast nooks, or when the kitchen opens to a garden, terrace, porch, or patio, then, traditional floor-length curtain panels are the obvious choice. In such cases, window and door treatments can be coordinated or completely different. Note that when incorporating curtains for practical reasons, such as providing privacy and light control, this doesn’t mean they have to necessarily be dark colored. Any opaque fabric option that offers adequate privacy and light control would work well. For a layered look, combine different kinds of window treatment, such as shades and valances or curtains and valances. Apart from adding personality, visual interest, and appeal, this approach will let natural light in when it is needed and provide privacy and light control when necessary. 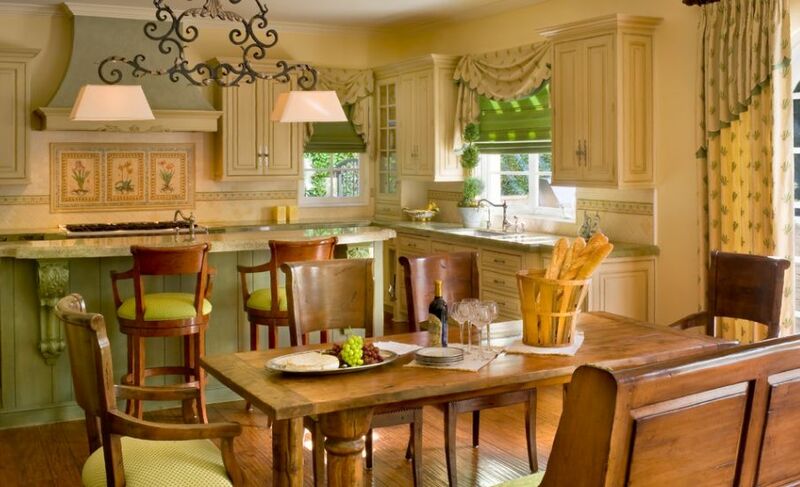 In the picture above, matching Toile window and door treatments add color and personality and lend this fascinating French country-style eat-in kitchen a balanced, finished look. Definitely an inviting space! For a cohesive, harmonious look, window treatment should be coordinated with other kitchen elements, such as furniture and appliances. Furthermore, if you don’t want a statement window treatment but prefer it rather seamlessly blend with the rest of the décor, opt for a color or a color combo that repeats the hues of the walls, cabinetry, backsplash, chair cushions, dining bench and chairs upholstery, or throw pillows. 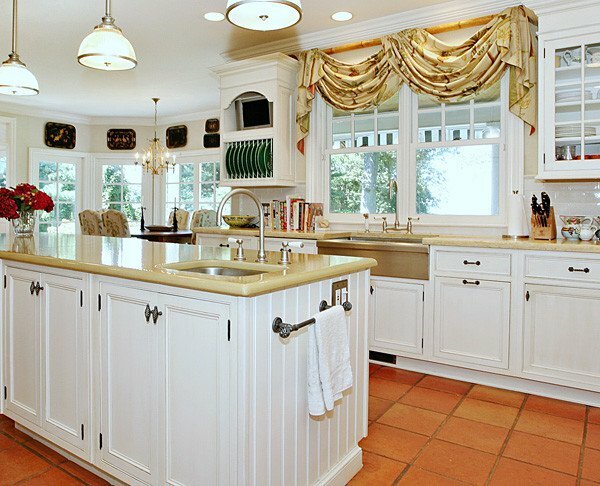 Above, a jaw-dropping traditional kitchen. Window treatment/combos of shades, valances, and curtains/ repeats the colors of the cabinetry, kitchen island, hood, backsplash, and chair upholstery and helps lend the space a balanced, harmonious look. A topiary brings extra freshness. Wood furniture creates a sense of warmth and adds to the organic vibe of the kitchen. What’s not to like in this room? 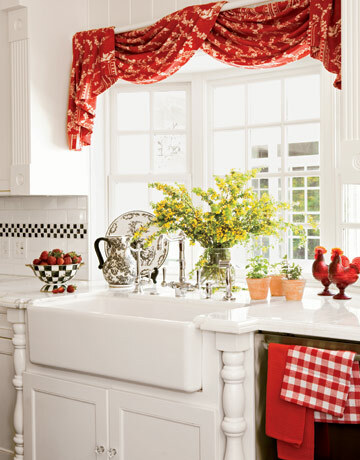 In the above-shown cottage kitchen, an eye-grabbing swag in red and white coordinated with towels in the same hues embellishes the space. Accessories in black and white add touches of drama. Potted herbs and a bunch of branches bring pops of color and freshness to this pleasing kitchen. 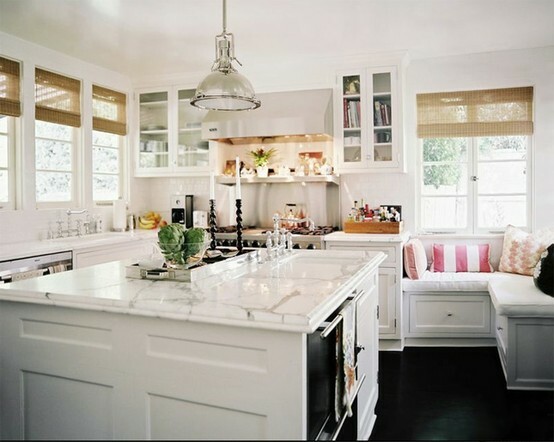 In the picture above, a dream-come-true kitchen. A combo of a shade and a valance used as window treatment definitely makes a statement. Actually, it serves double: on the one hand, offers privacy and light control and, on the other, beautifies the space, adds visual interest and softness, and helps create a layered look. Plus, the combo hues coordinate with the stove and the accessories. Touches of black add elegance and sophistication. 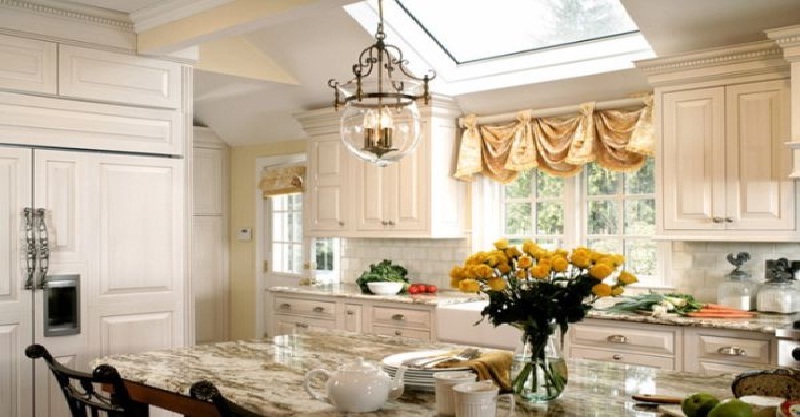 Whether incorporated to provide privacy and light and heat control or for purely ornamental reasons, kitchen window treatment is a common, easy, affordable way to add color, pattern, texture, and visual interest. Furthermore, when coordinated with other décor elements, it helps lend the space a harmonious, balanced look. 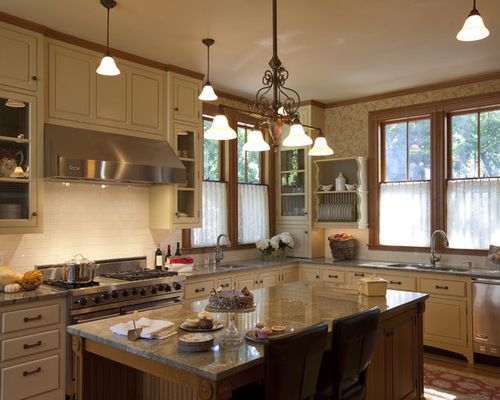 Generally, when approached with creativity, any kind of kitchen window covering becomes a statement décor element, which can personalize the space and make it unique. In this regard, any unusual material, such as burlap, napkins, or bed linens can do the job. Consider also DIY projects. Easy, budget-friendly no-sew solutions are possibilities that can be tried.